. ABC List of Contents - Nara Period . From August 1 to August 3, 2018, University of Zurich’s Chair of Japanology (supported by the Advanced Grant TIMEJ from the European Research Council) and the Research Institute for Time Studies at Yamaguchi University, in collaboration with the Japanese Society for Time studies held the International Time Studies Symposium 2018 “Time in Medieval Japan”. The symposium had the aim to explore the ways time was expressed, perceived, and experienced in medieval Japanese society from various angles. It brought together 25 researchers from the fields of intellectual and political history, literature, and religion of Japan hailing from various Japanese universities as well as from the United States and Europe for three days of presentations and extensive discussion. The program comprised papers and comments by designated specialists in the following seven fields: “calendars”, “military strategy”, “literature of the court and the warrior elite”, “village life”, “religion”, “the human body” and “markets”. Profs. Morino Masahiro, Morishita Tōru (both Yamaguchi University) and Hosoi Hiroshi (Kassui Women’s University) served as coordinators on the Japanese and Raji C. Steineck and his team at University of Zurich as coordinators on the European side. The first conference day on August 1 started with formal greetings by Profs. Fujisawa Kenta (Director, Research Institute for Time Studies, Yamaguchi University) and Raji C. Steineck (University of Zurich, PI of the ERC Advanced Grant Project “Time in Medieval Japan” / TIMEJ). The morning sessions were dedicated to the subject areas “calendar” and “military strategy”, with Prof. Franz Emde (Yamaguchi University) serving as designated commentator. The first paper titled “The Study of Time and Calendars in Medieval Japan”, by Prof. Hosoi Hiroshi started from a thorough review of research on calendars and annotated calendars (guchūreki 具注暦) and proceeded to demonstrate, based mostly on the Hoki naiden 『簠簋内伝』, the importance of these documents to understand the regional distribution and differentiation of time consciousness. Next, Prof. Kristina Buhrman of Florida State University in her presentation “An Investigation into Day-Selection for Military Actions in Medieval Japan” explained by way of a close scrutiny of the sources that the ancient court’s culture of day selection according to the annotated calendars was probably received and continued by medieval warrior aristocrats in their planning of military exploits. Dr. Ueno Taisuke (Kanda University of Foreign Languages) discussed medieval books on strategy and what they reveal about changes in time consciousness over time. He showed that while earlier sources assume that the time of actual battle belongs entirely to the gods, later sources insert elements of human discretion and manipulation into the conception of the time of battle. The ensuing comments and discussion followed up on the main points of each paper and highlighted points such as the issue of human agency, or the apparent absence of quantitative calculation of time in medieval discussions of military strategy. In the afternoon sessions,the subject moved to time in the literature of the court and the warrior aristocracy. In the first presentation, Prof. Morino Masahiro used the example of expressions pertaining to the call of the hototogisu 郭公／時鳥 (cuckoo) in the literature of court ladies to demonstrate how their expression of time was structured by the Kokinshū 『古今集』, and how, by the same token, the geographic aspect of the territorial boundaries of royal power strongly informed the temporality of the intratextual world in these documents. Dr. Simone Müller (University of Zurich) compared the late Heian Higashiyama gobunko bon Nittchū gyōji 東山御文庫本『日中行事』with a document of the same title written at the court of Go-Daigo (r. 1318-1339), in order to put into relief the chronography and units of time employed to regulate (at least in principle) life at court in the late Kamakura period in conjunction with questions of space and power. Alexandra Ciorciaro’s (PhD student, University of Zurich) paper on “Chronography in the official records of the Kamakura bakufu” presented a detailed analysis of the systems of temporal notation used in the Kenji sannen ki 『建治三丁丑年日記』and Buke nendai ki 『武家年代記』, highlighting not only quantitative, chronometric aspects, but also expressions pertaining to the properties of certain times, or their causal interconnections. Prof. Koyama Emi (Kyoto Institute of Technology) commented on each paper from the perspective of her own research into the illumination of ancient and medieval architecture and the ways it affected daily and nightly activities. The second day of the symposium started with Prof. Migita Hiroki’s (Yamaguchi University) presentation on “Night-time Labor by Pre-Modern Japanese Villagers”, in which he highlighted the fact that in pre-modern time, night-time labor was often embedded in ritual and play, and performed by groups of lower status. For some of these groups, movement was restricted during the day, but conversely, while “normal” members of society were largely confined in their movements at night-time, these groups could move about freely at night. To this, Prof. Tsuji Shōji (Hoken Iryō Keiei Daigaku) responded that these findings must be seen in the light of more general and constant aspects of Japanese village life. Pointing to the necessity of regular night-time work such as protecting the fields or going fishing, which was not allocated to specific status groups, he warned against over-emphasizing exotic aspects of earlier epochs of Japanese history. 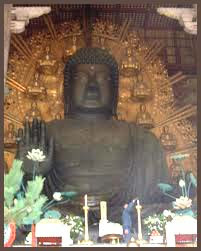 The following section on religion was opened by Prof. Yuasa Yoshimi (Saitama Gakuen University), who by way of a detailed comparative analysis of chronometrical expressions in the Buddhist sources contained in the Kamakura ibun 『鎌倉遺文』corpus demonstrated that monasteries, while sharing a certain amount of standard chronography, often had specific styles of temporal regulation and chronometric expression. The next paper by Prof. Yorizumi Mitsuko (Tokyo University) dealt with the concept of time in Dōgen’s Shōbōgenzō Uji 『正法眼蔵』「有時」. Prof. Yorizumi covered questions such as how far Dōgen’s idea that existence and time are inseparable is based on the mutual inter-dependence between different entities or how a privileged form of time that may be accessed through “practice and attainment of the way” had properties contrary to the irreversible, external and continuous character of profane time such as reversibility, discontinuity, and monadicity, giving a detailed analysis of the specifics of Dōgen’s – or Buddhism’s – concept of time as it is based on the ontology of muga / anātman. Prof. Steineck presented another paper on Dōgen’s concept of time, placing it in the context of medieval Japanese temporalities. Based on a rigorous analysis of the chronography employed in Dōgen’s writings, he discussed how the dimension of religious time as expressed in his term nikon (“now”, often interpreted as “eternal present”) is related to that of the “twelve hours”, which is mostly equated with profane time in the literature. Steineck specifically pointed out that the “eternal present” is constituted within the quantitative differentiations of time , and that Dōgen’s texts, in spite of the emphasis a large part of the literature places on the “moment” of practice and on the incalculable aspects of religious time, employ numeric chronometry to highlight the duration of practice of the patriarchs and to establish links between the “here and now” of practice and the time of the Buddhas and patriarchs. Etienne Stähelin (PhD student, University of Zurich), in his presentation on “The concept of time within early Kamakura period Sōtō Zen” explored the ways in which Dōgen’s thoughts on time were developed or re-interpreted by his disciples in the earliest commentaries on the Shōbōgenzō, remarking on their tendency to unilaterally stress the unity of all of time and every single moment over and against the differentiation between entities and their times. Prof. Maki Takayuki then discussed the “Transformation of the Buddhist Tonsure by Japanese Ex-Emperors in the late Heian Period”. He explained the changes in a rite of passage (the taking of the tonsure) as it was practised at court in this period in between the ages and how they related to changes surrounding the transition of office between emperors, which used to shake up the world of the highest echelons of aristocracy in the Heian period because of the interpenetration of this-worldly and other-worldly logic. The final paper in this section by Hoshi Yuya (PhD student, Bukkyō University) turned to the subject of medieval mythology. In his paper “Medieval Mythology and Time Consciousness”, he traced the genealogy of the stories surrounding Doshōjin 土公神 and elucidated how myths and rituals surrounding the calendar and the seasons evolved in medieval rural society. Commenting on this session, Prof. Bandō Yōsuke provisionally linked Shintō to public ritual and Buddhism to personal salvation, while also pointing to the entwinement of both aspects both in Dōgen’s texts and in the imperial ritual of taking the tonsure. The third day of the symposium started with two papers dedicated to the subject of the body and time. First, Dr. Daniela Tan (University of Zurich) demonstrated how the physiological cycles of the female body were linked to the movement of nature and especially celestial bodies in the chapter on women’s health of Kajiwara Shōzen’s Ton’ishō 『頓医抄』, leading to a cyclical interpretation of their temporal aspect. Next, in a presentation titled “Menstruation and Time Consciousness of Women in Medieval Japan”, Prof. Saitō Nahoko (Kokugakuin University) compared references to the female cycle in nikki such as Utatane 『うたたね』and Towazugatari 『とはずがたり』. She discussed how this cyclical physiological phenomenen affected time consciousness and time regulation of court ladies, highlighting aspects such as the establishment and loss of individuality and gender solidarity, for example in respect to the planning of religious and social activities. The commentator to this session, Dr. Anna Andreeva (Heidelberg University) emphasized the fresh perspective both papers provided on a subject that was traditionally mostly associated with kegare 穢れ (“impurity”), which allowed to transcend the confines of medieval female history. The afternoon of the third day was dedicated to the subject of “markets”. Prof. Sakurai Eiji (Tokyo University) reported in his paper on “Workday and Wages in Medieval Japan” that, while the prices for physical commodities were decided according to the relation of supply and demand, those for labor and services were not subject to this principle. He found that labor time was paid by the workday, and that there is no evidence suggesting that its value was measured in relation to the unit of the hour, and reflected on the relevance of this fact for medieval time consciousness. The following paper on “Dept Cancellation and the Renewal of Time” by Dr. Kataoka Kōhei (University of Zurich) discussed the “virtuous policy” (tokusei 徳政) of rescinding the sale of land and of cancelling debts from the perspective of time theory by way of a thorough analysis of pertinent documents, arguing that these measures should be interpreted as attempts to restitute an ideal, imagined past, and reflecting on the specifics of medieval ideas of property. Finally, Vroni Ammann (PhD student, University of Zurich) analysed chronometric and chronotypological expressions in the Kunshū ruishō 『薫集類抄』and the Gofushimi in shinkan takimono hō 後伏見院宸翰薫物方, two medieval books on recipes for incense as part of her project to trace the temporal aspects of production, trade, and use of incense in medieval Japan. In her comments, Dr. Angelika Koch (Ghent University) followed up on questions of wage labour and time consciousness, the temporal specifics of tokusei policies, and the use of incense to measure time in order to contextualize the findings of each paper. The symposium ended with a final round of general comments by Profs. Satō Hiro’o (Tōhoku University), Tsuji, and Bandō. Prof. Satō reviewed the contributions from the point of view of the social and geographical stratification of time consciousness and time regulation in medieval Japanese society, contrasting it to current notions of homogenized and linearized “modern” time, emphasizing the need to further research the relation between the apparent temporal plurality and the general social structure of medieval society. He also called into question facile dichotomies between medieval and modern time consciousness. Prof. Bandō followed up on these remarks, stating that while the ancient ritsuryō 律令state had possessed the power to homogenize previous plural time regimes, centrifugal forces (such as the strong tendency to rely on Buddhist images of time) gained more influence in the medieval period, which explains in part the stronger visibility of temporal plurality in this era. Finally, Prof. Tsuji placed the conference in the context of current societal issues. The conference was closed by Profs. Fujisawa and Steineck, who both emphasized the many insights gained through the multidisciplinary approach this conference took to the subject of time, and expressed their gratitude to everyone involved. Ancient Japan may have been far more cosmopolitan than previously thought, archaeologists said Wednesday, pointing to fresh evidence of a Persian official working in the former capital of Nara more than 1,000 years ago. Present-day Iran and Japan were known to have had direct trade links since at least the 7th century, but new testing on a piece of wood — first discovered in the ’60s — suggest broader ties, the researchers said. Infrared imaging revealed previously unreadable characters on the wood — a standard writing surface in Japan before paper — that named a Persian official living in the country. The official may have been teaching mathematics, Watanabe added, pointing to ancient Iran’s expertise in the subject. “Although earlier studies have suggested there were exchanges with Persia as early as the 7th century, this is the first time a person as far away as Persia was known to have worked in Japan,” he said. Nara was the capital of Japan known as Heijokyo from around 710 to around 784 before it was moved to Kyoto and later to present-day Tokyo. The discovery comes after another team of researchers last month unearthed ancient Roman coins at the ruins of an old castle in Okinawa Prefecture. It was the first time coins from the once mighty empire have been discovered in Japan, thousands of kilometers from where they were likely minted.
. onibi 鬼火 "demon fire" .
. kitsunebi 狐火 "fox fire" .
. hitodama 人魂 / 人玉 spirit of a dead person, "soul flame" . They are often seen in humid climates. . . tenpi, tenbi, tenka 天火 "fire from heaven" . .
Janjanbi (じゃんじゃん火 or ジャンジャン火) is a kaika told about the legends of various places in the Nara Prefecture. They are considered a type of onibi. in the Kōchi Prefecture, they are also called kechibi. Their name comes from the "janjan" sound that they make. There are many legends where they are people who have committed double suicides or military commanders among other deceased ones who have had their souls turned into balls of fire. there are different legends depending on the area, and different alternate names depending on the area. It indicates two balls of fire that appear in the graveyard of 白毫寺 Byakugō-ji and 大安寺 Daian-ji. In the 夫婦川 / 女夫川 Fūfu River (Miyotogawa ミヨート川), the two balls of fire would meet together, intertwine themselves, and then finally return to their graves. 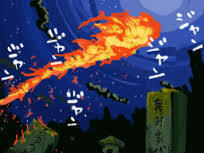 When a person sees this fire, it would come closer to that person, and even when those who are chased by the janjanbi flee into the middle of a pond, the fire would still follow them above the pond. They are said in the legends to be a man and a woman who committed double suicide, and since they were buried in separate temples after death, they became balls of fire that meet together. Similar legends are told at 打合い橋 Uchiaibashi bridge. It indicates two hitodama 人玉 (human fireballs) that would visit every year in June 7th on the bridge above the 佐保川 Saho River. Just like the ones from Byakugō-ji town, they are also the spirits of a man and a woman. It was said that there was previously a custom when it was June 7th for 20 men and women to be selected from each of the surrounding villages and dance above the bridge where they appear frequently, in order to console the spirit of the hitodama. It indicates a ball of fire that would appear from the remains of a castle and fly westwards. For those who encounter this, it would be necessary for them to hide under a bridge and wait for it to pass. It is also called Zannenbi (残念火, lit. "disappointment fire"). On a summer night when rain is near, by turning towards the 十市城 Tōichi castle and saying, "hoi hoi, hoihoi" two times, it would come flying, make the sound "jan jan" and then disappear. It is also called the hoihoibi (ホイホイ火). It is considered to be the vengeful spirit 怨霊 onryō of the military commander 十市遠忠 Tōichi Tōtada who was slain by 松永弾正 Matsunaga Danjō in the Azuchi–Momoyama period, and those who see it would, by the onryō's curse, become sick with fever for three days and nights. 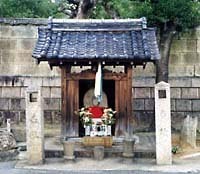 When Tōtada was slain, the killed soldiers all said "zannen, zannen (disappointment, disappointment)" as a crowd of voices, which is why it was heard as "jan jan."
Also, in 田井庄町 Tainoshōchō, Tenri, there is a Jizō with its head separated called the "kubikiri Jizō (decapitated Jizō)," but it is said that a soldier who was being attacked by the janjanbi in the past swung his sword around and mistakenly cut off the head of a Jizō by the roadside. It was said that in the end, that soldier died completely burning. Once a villager saw two fires come down from Mikasayama 三笠山 on the evening of the event "burning the mountain 山焼き. It was a yellow fire which slowly turned blue-green. Other seasons to see them there are from Winter toward Spring. Sometimes they appear suddenly very bright and are gone in no time again. In the North of Nara, at the village of Hoorenji 法連寺町 Horen-Ji there are legends at the temple トモ寺 Tomo-ji and 岩淵寺 Iwabuchi-Ji about double-suicide. It is said that the lovers had committed double-suicide and the woman was buried at Tomo-Ji, while the man was buried at Iwabuchi-Ji. one ball of fire is called タマヒ tamahi. Two or more are called janjanbi. 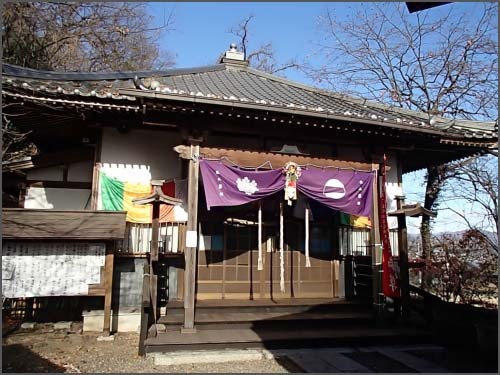 The Janjan Fire at temple 大安寺 Daian-Ji is related to the revenge killing of an enemy (adauchi 仇討ち). The older brother was tending to the fields when a bit of earth hit the passing 生田伝八郎 Ikuta Denpachi, who willed the farmer in his rage. Both brothers became "demon fires" after that. (This story is better known as 崇禅寺馬場の仇討 Sozen-Ji baba no adauchi), happening in 1715, and now also a famous Kabuki play. three lived tow brothers. One was killed by a samurai from Koriyama 郡山藩. His brother, who wanted to revenge him, was also killed when he tried to. Now both appear as Hinotama. At the beginning of the road 一条通り Ichijo Dori near the riverbank of Takahashi, there is a long ball of fire, emerging from an old tree. It usually appears on a rainy night and flies with a blue-green light. In the middle of the fire there is the face of an old man. This is the vengeful spirit of a high official from the Nara period, who had been killed there. Once upon a time there was a water shortage and the farmers fought with their hoes (kuwa 鍬) until in the Summer heat the sparks of the metal begun to fly around. A young samurai named 亀井式部 Kamei Shikibu fell in love with the poor farmer girl 深雪 Miyuki and they often met at the bridge 打合橋 Uchiaibashi. The authorities found out about it and he was beheaded right on the bridge. This was the 7th day of the 6th month. The head begun to fly away, drawing a red line of blood in the sky. Later Miyuki killed herself below the bridge, holding his head in her lap. Since that day the Janjanbi is seen on this night in the 6th lunar month, coming from the Northwest, and dancing above the bridge. To appease their souls, the villagers now dance on the bridge on that night.
. ABC List of Contents - Heian .
. Books about the Nara Period . The Shoku Nihongi is an imperially commissioned Japanese history text. Completed in 797. ... translation iof this segment of Shoku Nihongi, the official court chronicle of Japan’s eighth century. 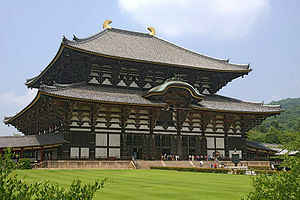 It includes Emperor Shōmu’s declaration before Rushana Buddha at Tōdaiji, Shōmu’s abdication and the accession of Empress Kōken, Hachiman’s entry into Nara, the death of Emperor Shōmu, and the suppression of the Tachibana Naramaro conspiracy.
. Persons of the Nara Period .
. Shrines of the Nara Period　神社 .
. Kasuga Taisha 春日大社 .
. Temples of the Nara Period　寺 .
. janjanbi じゃんじゃん火 / ジャンジャン火 Janjan fire legends .
. koma 独楽 spinning tops . introduced in the Nara period via Goguryeo 高句麗 Goryeo (called Koma in Japanese).
. mingei　民芸 Nara Folk Art - 奈良県 .
. Persia and Nara 奈良時代 / ペルシャ人役人存在 .
. Shoosooin, Shōsōin 正倉院 Shoso-In treasure house .